Fifteen pilots out at Kahana yesterday, including three of our newest members, Randy, Bill and Alan (way to go guys). Conditions were light for a while and not everyone flew as long as they wanted. 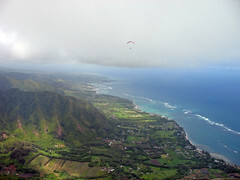 Scot and I were determined to seek our fortune downrange, so we hitched a ride on the cloud bellies to jump the valley. Lift was light on both of the next ridges, but it was a fun little trip - Scot landed at Hauula, and I squeaked into Pounders. Thanks to Johan for the pickup! Thanks for the post Alex and congrats to the first time Kahana pilots. Bill might have his first nick name as HIllBilly but that's another story. Kahana sure is a great place to fly. on my first day with the new tandem glider (SOL kangaroo 2) I first had a sleder ride with waianae Jim (almost made it high, but it got very light after my launch). and then as the winds picked up and it was McCloud's turn. at this time the wind was a lot stronger and we had to hike from the top to low launch as the windspeeds increased as we were getting ready. the new glider proved to be very easy to turn, more like a solo glider than a fat slow tandem! even accelerated it had a great glide and we almost crossed the bay (even being light in the wing). That was a sweet ride, but cold! after 35 minutes in the air the wind speeds were increasing and the cold took the best of us and we landed. Thanks Jim and Jeff to trust and fly with me! Congratz to our new solo pilots! keep up with the good job, keep kitting and learning (hopefully NOT learning the "hard" way). most if not all pilots like to share their knowledge and skills, just ask us! let's keep it safe so all can enjoy. and last but not least, let's welcome our new friend and pilot from Venezuela Jorge Atramiz and his wife Carolina. they will be living in hawaii for at least 2 years. I know he looks familiar but don't ask him "don't I know you?" I am sure he is tired of it and I am not gonna say from "where" you "met" him.... I'll let you figure it out, good luck! By the way, he is looking for a place to rent, preferably in north shore.